The red edge color really pops on these business cards. We came across these cards recently when pulling samples for a client and were surprised that we haven’t posted them. 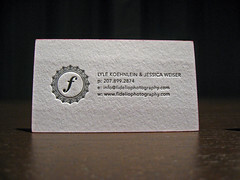 Lyle & Jessica came to us back in 2009 (I know it’s 2011) for business cards to coincide with their rebranding and website launch for Fidelio Photography. 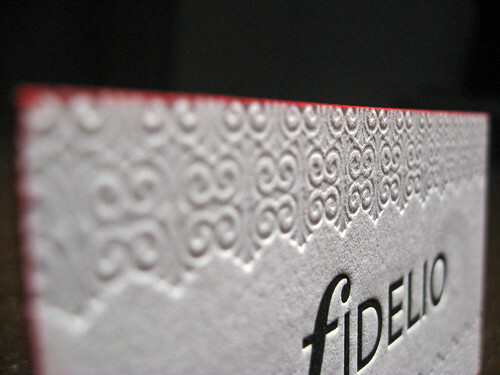 We really like the blind pattern on the front of the cards and the contrasting edge color. We worked with Jessica using elements of their brand and logo to design new business cards. The final result was really great! 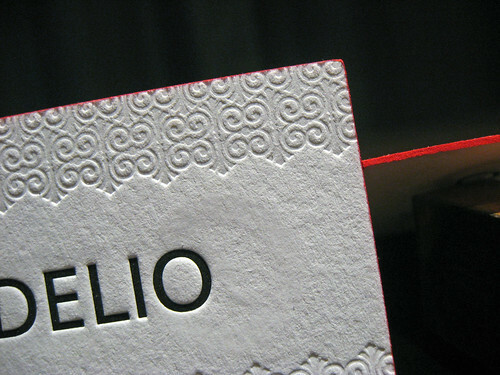 The cards were letterpress printed on 220lb lettra in fluorescent white. We chose 220# stock for two reasons, 1) the double sided card and 2) edge coloring. The pattern on the front of the card was printed blind, with no ink. The 220# stock allows both sides to get a nice impression! The back of the business card is where the business goes down … like an inverted mullet: Business on the back and party on the front. 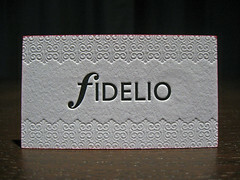 The (f) design uses the same pattern as the front of the card and is actually the watermark Fidelio uses on photos. The cards were edge colored in a bright red which helps make the cards stand out in a stack. Edge coloring cards with a bleed (blind or colored) can be tough but the finished result is really neat! 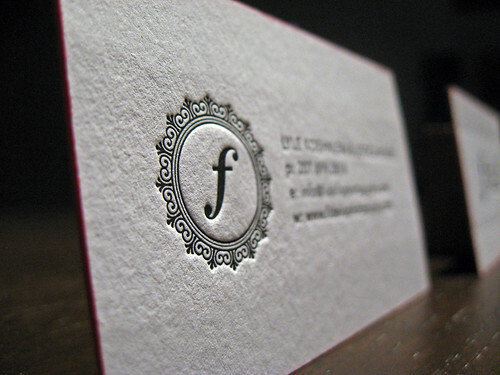 What’s your favorite part of a business card?